On Monday, Soul superstar was in for a huge shock onstage in Mexico when her concert was crashed by a bat. Performing at the Palacio de los Deportes in Mexico City, the Hello hit maker saw something rather unusual in the audience during the middle of the show. Video footage was posted online in which Adele had begun to shriek. She said there was a bat and had eve flapped her arms to mimic the presence of the winged creature. The star was absolutely stunned and had pointed out the bat to her fans in the crowd. She said that there was a bat in the audience, which indicated that they were indeed in Mexico City and she just loved it there. After the unexpected scare, the singer succeeded in continuing her show. 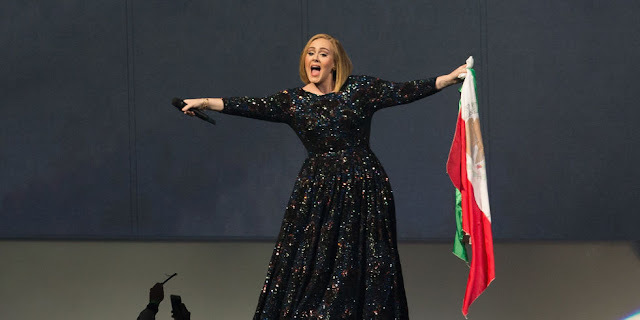 Later on, Adele even paid tribute to her fans in Mexico as she said that they made her feel right at home during her first few performances in the country. The singer said that she was grateful for the opportunity and thanked people for coming to see her. She even performed for a second time at Palacio de los Deportes on the next day. The North American leg of Adele’s world tour will come to an end on 21st November in Phoenix, Arizona. The singer is then planning to take some time off for the upcoming festive holiday season. On Monday, Adele also announced on Facebook that she will also be going to her very first trek to the land Down Under i.e. Australia. She said that after 10 years in the industry, she was finally heading off to Brisbane, Perth, Adelaide, Sydney and Melbourne. Five big shows will be performed by the hit maker, which will begin from 28th February in Perth. She will then make stops in Brisbane, Sydney and Adelaide respectively. Her tour will come to an end on 18th March in Melbourne.